28 F A ll 2018 Practice l ink.com F I N A N C I A L F I T N E S S program under the terms of the program at the time you took out the loan. Secondly, if you're actively working toward repaying your loans through the PS l F program and have made economic decisions based on the program's details, you've demonstrated a reliance on the terms as they exist today. As such, the federal government may be obligated to grandfather you in through any changes to the laws. In summary, we hope this means you're unlikely to be affected by the proposed changes. 3 When and why would it make sense to consolidate my loans? In July 2010, Direct Loans became the lender for all federal student loans. Stafford and Grad P lu S loans borrowed prior to this time may have been originated by a private lender (Sallie Mae, Wells Fargo, etc.) under the FF el program. These loans need to first be consolidated to Direct Loans before making IDR payments on them will qualify for PS l F. Furthermore, Perkins and select need-based loans are not eligible for an IDR on a stand-alone basis, but they can be consolidated to Direct Loans for eligibility. Variable rate loans originated before July of 2006 can also be fixed at extremely low rates through consolidation. If you've yet to enter an IDR, the first step in your action plan is to review all of your loans and determine if a consolidation is necessary to maximize your savings opportunity. If you have already completed qualifying payments towards PS l F, consolidating to a new loan will actually create a new loan and erase your progress toward PS l F. Don't do this! 4 What is loan forbearance, and why might using it be a bad idea during my training? Isn't that what residents used to do? In forbearance, no loan payments are required, but interest continues to accrue. It's true that in past years, many residents did not pay on their loans during training. 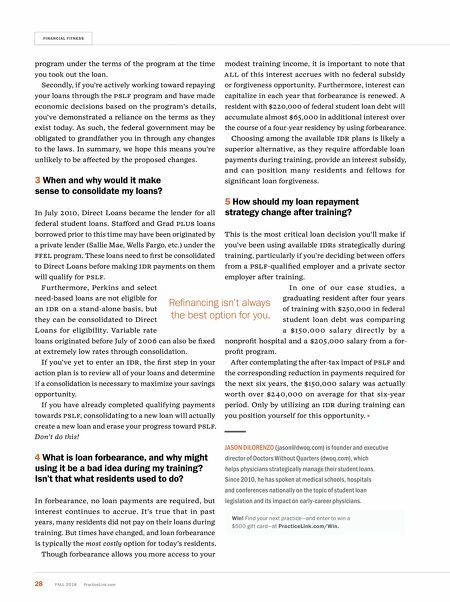 But times have changed, and loan forbearance is typically the most costly option for today's residents. Though forbearance allows you more access to your modest training income, it is important to note that A ll of this interest accrues with no federal subsidy or forgiveness opportunity. Furthermore, interest can capitalize in each year that forbearance is renewed. A resident with $220,000 of federal student loan debt will accumulate almost $65,000 in additional interest over the course of a four-year residency by using forbearance. Choosing among the available IDR plans is likely a superior alternative, as they require affordable loan payments during training, provide an interest subsidy, and can position many residents and fellows for significant loan forgiveness. 5 How should my loan repayment strategy change after training? This is the most critical loan decision you'll make if you've been using available IDRs strategically during training, particularly if you're deciding between offers from a PS l F-qualified employer and a private sector employer after training. 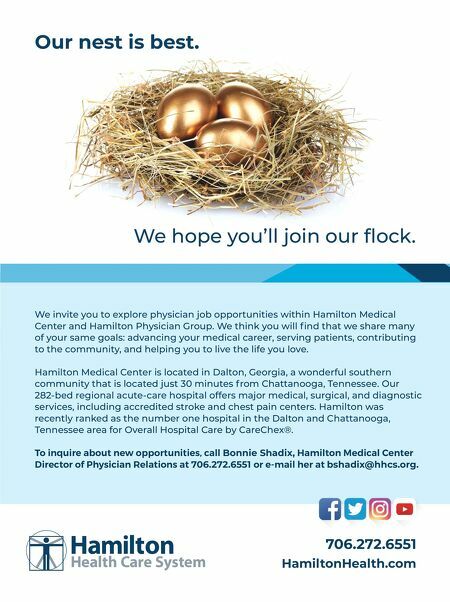 In one of our case studies, a graduating resident after four years of training with $250,000 in federal student loan debt was comparing a $150,000 salary directly by a nonprofit hospital and a $205,000 salary from a for- profit program. After contemplating the after-tax impact of PS l F and the corresponding reduction in payments required for the next six years, the $150,000 salary was actually worth over $240,000 on average for that six-year period. Only by utilizing an IDR during training can you position yourself for this opportunity. JASON DILORENZO ( jason@dwoq.com) is founder and executive director of Doctors Without Quarters (dwoq.com), which helps physicians strategically manage their student loans. Since 2010, he has spoken at medical schools, hospitals and conferences nationally on the topic of student loan legislation and its impact on early-career physicians. Win! Find your next practice—and enter to win a $500 gift card—at PracticeLink.com/Win. Refinancing isn't always the best option for you.